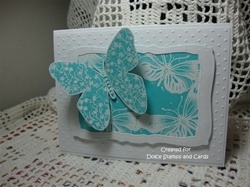 I love Butterfly's so I love making butterfly cards. These My Heart Stamps for You butterflies are so much fun to work with. 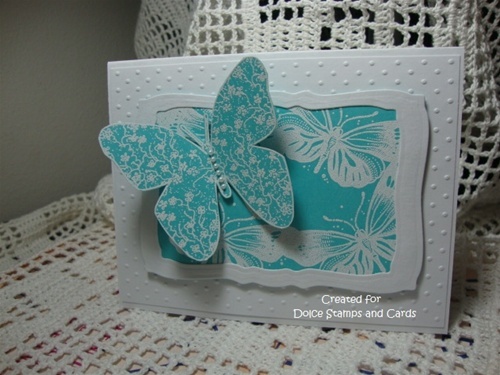 I started by embossing a "field" of butterflies which I then cut and framed using Spellbinders Curved rectangles. I then embossed the larger, Floral Butterfly, cut it out , dressed it up with a few seed pearls and let it hover over the "field" I'd created. I popped the whole frame up off the white background which I had embossed with small dots to give texture. I really like the way this turned out. I hope you do to. It can be used for any occasion.